"Touchdown recipes with the ocassional fumble." I'm a stay at home mama and fumble my way through the kitchen to get meals on the table. That's why I call myself the "Pretend Chef". I only think I know what I'm doing. Haha! Thank goodness for recipes. Started with my Mama, Food Network, cookbooks, and now my fellow food bloggers. The portion sizes are too large and recipes are hit or miss. Diet that helps you lose up to 15 pounds in 32 days! Diet food done right. Angus sandwich with egg and bacon = heavenly! Fresh guacamole and beef fajita tacos = the usual! Naan bread, hummus, spinach salad, baked chicken thigh, chicken skewers = Authentic done right! Amazing! Thank you so much Priyanka. I was happy to find you on here as well! Did you end up trying the soup? Hello:)I'm quite lucky,my mum doesn't live that far from me (thank goodness) and she babysits for us at least once a fortnight:)Yeah being a mum sure is hard work isn't it?lol.Do u want any more kids?I've got one of each,so i'm really happy with that:)I think i'd go nuts if i had another one!lol! That is great that you have that family support. I would love to have a real date night with my guy. We've talked about having more kids. I love having a boy and would love to have another boy. I'm not sure how I would do with a girl. Not much of a girly girl. I try but I don't even really know how to put on makeup. Do you have a blog? Yeah i know the feeling...i have an 8 year old son and a 4 year old daughter!lol!But its not so bad for me as my son is at school during the day and my little one goes to nursery in the afternoon for 2 hours...i try to get all of my housework done in the morning so that i have the afternoons free:)Do u not get much time to yourself? My guy works out on the road for a living and he sees home maybe one weekend out of the month during the Spring and Summer months. He is at home for almost three months during the Winter when the weather is not good for travel in his line of work. We live 2000+ miles away from both of our families so I don't have any extra hands to take him for a couple hours if needed. When my guy is home though I feel like I can finally take good showers. Haha! Itty bitty does take naps but that is when I can clean up the damage he's created and get the house back in order. I do try to take an hour or so to myself in the morning or stay up an hour later at night. It works. I'll have to browse through there when I get some down time again. Not much down time with a 2 1/2 year old. Hi...i'm a stay at home mum too:)My cottage pie 'is' really yummy...u should give it a go:)I just joined here yesterday....i have plenty more recipes that i'm going to put on!lol! I have a blog at http://imapretendchef.blogspot.com if you want to check it out. I have lots more recipes on there. I'm new to this site as well! 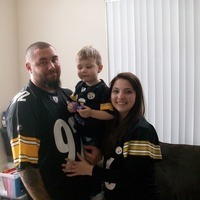 Hi, loved the pic you put up of your family...thanks for "following me" and I look forward to enjoying and trying out your recipes too! Thank you for the compliment! 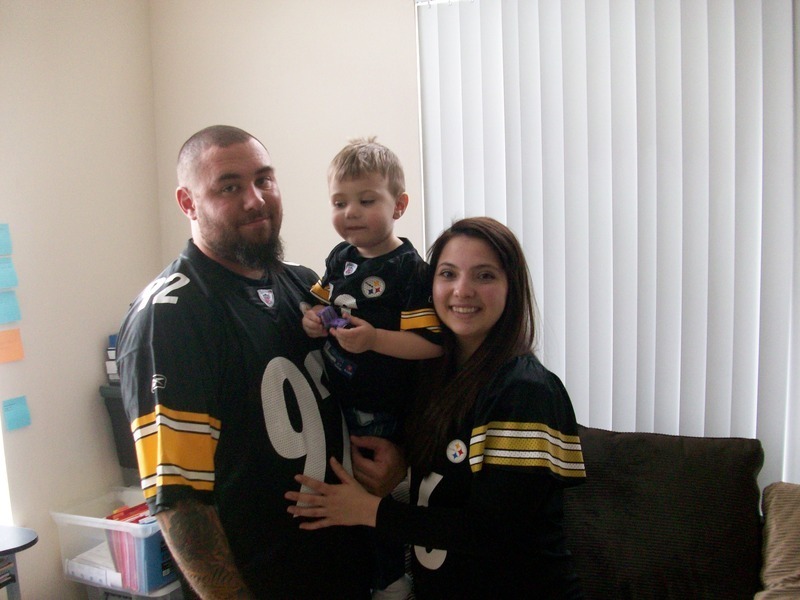 We love our Pittsburgh Steelers, haha! Can't wait to see what you are up to in the kitchen as well! When you post a recipe how are your friends informed? Or do you just have to click on their individual pages to see what they've cooked up? Glad you joined us Pretend Chef. I hope you enjoy the recipes here and I look forward to trying some of your favorites! Being an at home chef is a tough job - three meals a day, 365 days a year and not very many days off! I think we all feel a little like we're pretending on most days! Hi! Being an at home chef is a tough job - three meals a day, 365 days a year and not very many days off! I think we all feel a little like we're pretending on most days! Best wishes! Don't forget the two snacks, haha! I love being in the kitchen minus the doing dishes part!